Handcrafted glass vase from the Flora & Fauna collection. Adorned with pewter sculpted lilies and tulips plated in 14 karat gold and finished in hand painted enamel and Swarovski® crystals. 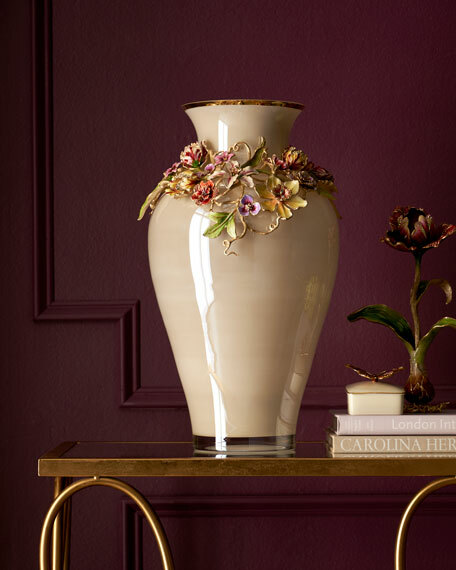 EXCLUSIVELY AT NEIMAN MARCUS Handcrafted ceramic vase. Golden chain detail. Hand-painted. 11"Dia. x 13"T. Made in Italy. Handcrafted vase in unique tree trunk design. Hand-painted and carved resin. 8.8"W x 8.3"D x 12.3"T. Imported.